RECIPIENT INFORMATION: Closed for Long Holiday Weekend. Our studio will re-open Tuesday, April 23rd. We will respond within 30 minutes of current business hours. Fields with a red asterisk (*) are required information. DELIVERY DAY and DATE - Closed for Long Holiday Weekend. Our studio will re-open Tuesday, April 23rd. We will respond within 30 minutes during regular business hours. If we miss the mark, it is possible your e-order has gone astray. Please call 416-489-7246. Open six days per week except long-holiday weekends and Christmas week. Open weekends of many floral holidays like Passover, Mother's Day and Valentines. CALL AHEAD? 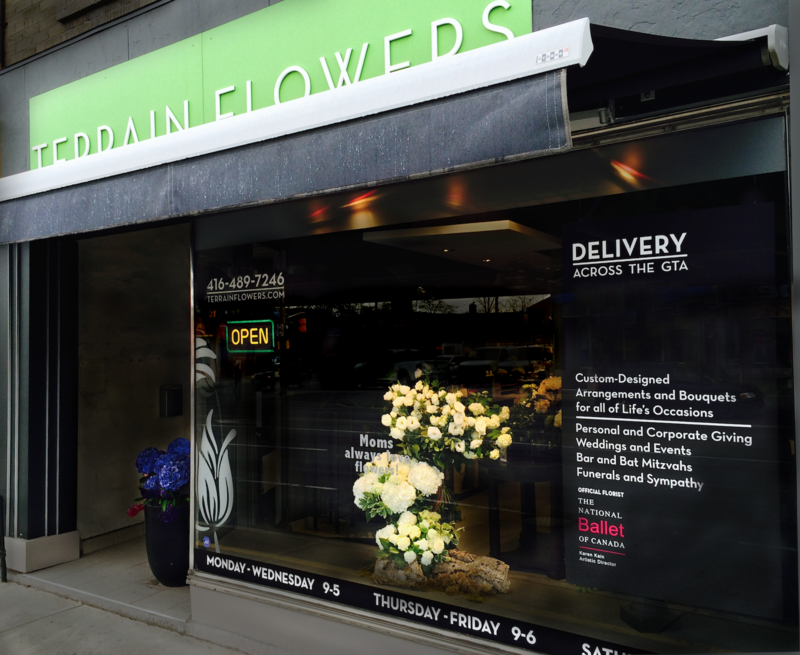 Our call ahead service protects your flowers and ensures delivery! Please note: it is our practice to call the recipient's home or office to notify and/or confirm your chosen delivery date and address or the date that works best for the recipient. Our call ahead service also enables us to confirm and correct address details! Open 9-5:30 Monday to Friday, and 10-2 on Saturday. However, we close long holiday weekends (Saturday, Sunday and Monday). A - Regular Delivery B - Best Method/Expedite - When you need us to pull out all the stops! Additional fees apply. Applies to most orders to be delivered within Toronto (exclusive of the GTA) placed any day or time before 11AM of your chosen delivery date. Delivery time is typically 1 to 5pm for businesses, 1 to 6pm for residences, and 1 to 3pm for schools. With some exceptions, "Regular Delivery" is used unless otherwise specified by sender. When your flowers "just have to get there against all odds." Allow us to determine the best method required to ensure your floral gift arrives, based on our experience and the time your order is placed. Additional fees or surcharges may apply. Delivery and HST are extra. Specify your gift by size and price within one of three categories (SM, MD, or LG). Delivery and HST are extra. Flowers - in a vase Flowers - without vase (hand-tied) Potted Blooming Plant Potted Foliage/Green Plant Potted Orchid - $85 and up Gift Certificate - $75 Gift Certificate - $100 Gift Certificate - $150 Gift Certificate - Year of Flowers For instance, specify your preferred gift such as a hand-tied bouquet, vase arrangement, or planting. For a small design, select within this range. For a medium-sized design, select here. For a larger design, select from this range. PREFERENCES --- Please indicate colour or flower preferences. Availability and colours may vary from season to season so please provide a second alternative. Or, allow our designers to choose for you! Add the finishing touch to extra special gifts with gorgeous gift wrap or card, or both! Specify your gift by size and price (SM, MD, or LG). Delivery and HST are extra. 7.00 Greeting Card with Gros Grain Ribbon 3.50 Thank You Card (oh-so-cute!) with Gros Grain Ribbon Include a greeting card secured with gorgeous gros grain ribbon for $7. Small for 5.00 Medium for 7.00 Large for 10.00 Your gift is presented in black and white striped paper with gross grain ribbon that's sure to expressions of joy, even before they know notice the flowers! MY INFORMATION --- Fields with a red asterisk (*) indicate required information. Yes, keep my e-mail on file and inform me three or four times a year about special holiday hours (whether extended or reduced)! ...thanks, however I get enough e-mail. Use my personal credit card, which you already have. Use my work/business card, which you already have. I will call with my credit card details. Invoice me or my accounts payable department (as pre-approved). See below! How did you discover Terrain Flowers? I have been a customer for a while. I recently received flowers from Terrain! I heard about you from a family member/friend/co-worker. of a Google online search. of another internet search. I noticed your shop while driving/walking through the area. I live/work nearby. Thank you for choosing Terrain Flowers. Have a good day! Closed for Long Holiday Weekend. Our studio will re-open Tuesday, April 23rd. Please note, we are open from 9AM to 5:30PM each weekday, and 10-2 on Saturday. We will respond within 30 minutes of current business hours. Our goal is to personally acknowledge your order within 30 minutes of receipt or start of our business day. For same day and super rush orders, please call 416-489-7246.